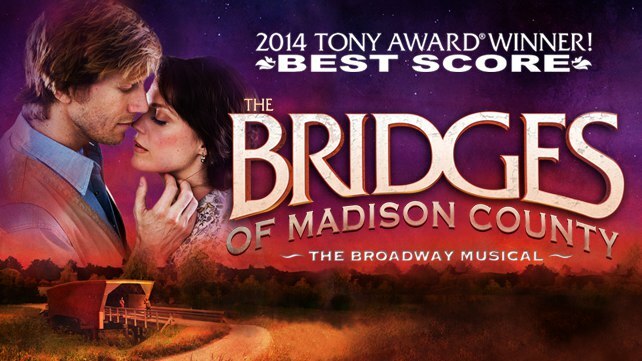 Sunday night I had the special treat of seeing The Bridges of Madison County starring Elizabeth Stanley and Andrew Samonsky and conducted by three time Tony award winner Jason Robert Brown. The book was also written by one of my favorite playwrights, Marsha Norman. (Novel written by Robert James Waller) I wondered how this timeless story that also has a film with two iconic actors would translate to a musical and I was pleasantly surprised to see that the musical was a perfect vehicle to tell this story about longing, love and loss. Set in a small farming town in Iowa, an Italian housewife and mother of two finds herself in a wrinkle in time (One Second and a Million Miles to be exact) when National Geographic photographer, Robert Kincaid, shows up on her doorstep looking for one of the covered bridges of Madison County. Having recently been to Naples, her hometown, Francesca is awakened with nostalgia and remembrance of the girl she used to be when Robert shows her his recent photographs from the trip. With Francesca's family gone to the state fair for a few days, she welcomes Robert's company which quickly evolves into a passionate love affair. Robert asks Francesca to come way with him and she asks him not to leave her. When her family returns she is faced with the difficult question of how to spend the rest of her life: to love or be loved. I have never been one for love stories, for whatever reason, they are not my preferred genre of choice. But what I have always loved about this story is that it was a complex love story, one that requires the characters to make difficult choices and to weigh their relationships and obligations against their desires. It explores the potential trappings of marriage and family as well as the trappings of a life outside of that world. The trappings of the heart. The set amplifies this feeling with an eery but beautiful backdrop of open farm land with one solitary tree that looks similar to an Andrew Wyeth painting and three posts that lower over the stage at different points to suggest the covered bridges, which also closes the characters in, like boxes or cuffs. The music is not your typical score, with everything from blue-grass country to a little Motown to acoustic guitar to classic orchestra carried with Stanley's powerful operatic voice. Samonsky holds his own and makes for a hunky free-wheelin' and somewhat lost Kincaid, but Elizabeth Stanley steals the show. Her loneliness and longing palpable while her ultimate decision equally heartbreaking. I loved this musical, loved everything about it - the music, the performances, the set all in Los Angeles' famous Ahmanson theatre. Jason Robert Brown will be conducting every performance of this masterpiece, so do the right thing and go see this show! It runs now through January 17th.